Maple Ridge is just a 45 minute drive, east of Vancouver, on either Highway 1 or 7. It has so much to offer both residents and visitors. The rugged, rural setting allows for a multitude of outdoor activities. These can be enjoyed at one of Maple Ridge’s sprawling, picturesque regional or provincial parks. All while taking in remarkable views of the Golden Ears mountain peaks, and other coastal mountain ranges. However, it’s difficult to appreciate the beauty that surrounds the area through the layer of grime that inevitably builds up on the windows of your home or business. That’s where our Maple Ridge Window Cleaning Service comes into play. 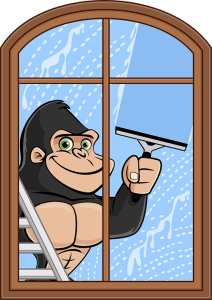 Here at Gorilla Property Services, we recommend at least a bi-annual Maple Ridge Window Cleaning Service. This will maximise your property’s potential and get the longest possible life from the glass in your windows. We do this by offering residential and commercial clients the highest standard of exterior and interior window cleaning services 3 storeys and below. Our fully trained and certified Gorillas carry out our Maple Ridge window washing service by hand. They use biodegradable, earth friendly cleaning solutions. In addition, they use pure rubber squeegees. These minimize static build-up and guarantee a longer lasting, streak-free shine. Of course, not just the glass gets dirty. Our changeable climate here in B.C. can be brutal on the exterior of your home, particularly between October and March. This is when Maple Ridge sees most of its annual rainfall. Gorilla Property Services takes pride in a ‘completely clean’ result. That means you won’t want to go anywhere else for your Maple Ridge Window Cleaning requirements. With this in mind, our technicians don’t just clean the glass but wipe down every sill. If requested, they will add washing the entire frame to the roster.